If you want to go bowling but don’t have your own bowling shoes, what do you do? You rent them. If you want to go on a road trip but don’t own your own car, what do you do? You rent one. If you want to begin sending campaigns to a list of subscribers but realize that you don’t have a list established yet, what do you do? If you said that you would rent one, that would be wrong - at least if you want to sign up for an account with Benchmark Email. We do not allow lists that have been purchased, rented or harvested. 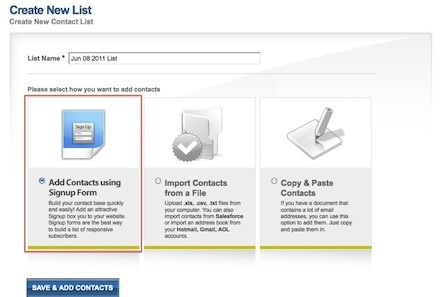 So how do you take advantage of email marketing if you have not yet established your own list of contacts? You would want to sign up for our “Free Edition” version of Benchmark Email. With this version of Benchmark Email, you start from scratch with your contact list. You place a signup form onto your website, blog, Facebook, etc. People sign up and are automatically added to a list in your Benchmark Email account. You can then begin sending campaigns to those who have signed up. The option to “Import Contacts from a File” and “Copy & Paste Contacts” are disabled. The only way to have lists with the free edition is to add those contacts with a signup form. Other than this small difference, Benchmark Free Edition is the exact same product as our subscription service, only it’s completely free. Really. Email tracking, drag & drop editing, online surveys, video, award-winning templates and unlimited email campaigns are yours free forever. Benchmark Free Edition was created to help people that are new to creating email marketing campaigns. If you are a more advanced user with an established list of contacts, you will want to view our different pricing plans to determine which one best suits your needs.